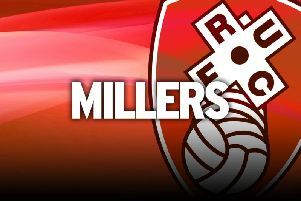 Matt Derbyshire’s first league goal for the Millers capped a convincing 4-2 win for Rotherham United tonight, although late goals from Bolton’s Liam Trotter and Matt Mills made for a nervy last few minutes for Steve Evans’ men. Rotherham boss Evans left three of his new signings on the bench as attacker Danny Ward, winger Adam Hammill and midfielder Jack Barmby were named as substitutes, with midfielder Conor Newton coming in for his first league start. Midfielder Ben Pringle and striker Matt Derbyshire were also recalled, and it was Pringle who opened the scoring in the game’s opening stages with a volley at the far post. Connor Sammon then made it 2-0 to the Millers, tapping home from close range after Derbyshire’s shot from long-range had been saved. Wanderers have signed Adam Le Fondre on loan but the former Millers hitman can’t play for them until Saturday. Earlier, the Millers had been well on top and Derbyshire and Paul Green both went close, the latter flagged offside when bearing down on goal. Pringle then became the first player of the evening to be cautioned, before Darren Pratley enjoyed the away side’s first shot of the afternoon on the half-hour mark. His miscued effort sailed harmlessly wide of Adam Collin’s goal. But Green got his goal shortly before the half-time whistle, glancing in Derbyshire’s cross to cap a dream first 45 minutes for Steve Evans and his Millers. Rotherham United: Collin, Richardson, Morgan, Arnason, Fryers, Newton, Green, Smallwood, Pringle, Sammon, Derbyshire. Subs: Thompson, Brindley, Wood, Bowery, Ward, Hammill, Barmby. Bolton Wanderers: Lonergan, Mills, Ream, Feeney, Dervite, Danns, Pratley, Gudjohnsen, Vela, Wilkinson, Kellett. Subs: Bogden, Moxey, Spearing, Trotter, Wheater, Odelusi, Walker.